We have the staff with the qualification specialized in package. "Package experts" who have professional knowledge and qualification will propose and advise from every aspect. In our company, we define our sales persons as a package planner. In fact, most of them have the qualification of “a certified packaging adviser”. Packing, packaging, lapping…following many customers’ style, we propose the most suitable combination of materials and forms for customer’s products among limitless choices from the viewpoint of an expert. 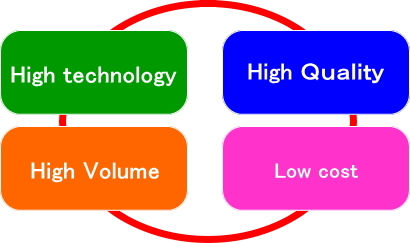 Furthermore, for example, about buffer material; “what kind of protection is required?”, about display method; “what way of showing is effective?”, and about transportation method; “what mode of transportation is safer?”, we will propose optimal plan from comprehensive perspectives in every phase. What is the reason why we can propose unique ideas...? There is the secret which enables us to propose novel ideas that anybody else doesn't think up. 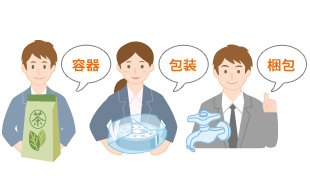 Even the term of “package”, there are various kinds of package necessary or suitable for each condition. For example, what you package is big or small, hard or soft, and organics or inorganics, where to keep is warm or cold. We have business transaction with more than 4,000 different types of companies from major manufacturers to small farms. Through those businesses we have cultivated enormous know-how and data at 6 business offices of west and east Japan. Such huge accumulation of information which cannot be got just in one business type enables us to propose innovative ideas. 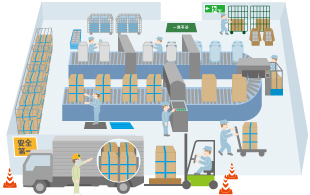 Make your management more efficient by solving various problems of packaging. What you will find when you change your package is the promotion of your management. The improvement of the work efficiency of packaging and the cost reduction of transportation. We will propose you further better plans to promote your productivity and profitability than mere product proposal or sales. We have been making efforts to solve problems all over the process from producing to transportation.